The Compass Blog, Driven by Waze: What Is a Good Click-Through Rate for a Location-Based Campaign? Whether you're targeting at the country or city level, or tying display advertising to a physical geofence around a building, consumers pay attention because information is immediately relevant to their needs. xAd reports that, globally, 80 percent of marketers are using some type of location-based marketing in their mobile ad campaigns. Most marketers know that location-based marketing is important for businesses, yet many are unclear as to what CTR reflects good performance. Here are some factors to consider. Adding the context of location can help improve campaign CTRs. Not all location-based marketing is created equal in terms of CTR. There are different levels of location-based awareness. Geofencing uses a physical boundary around a precise location, such as a store, to trigger an ad or push notification. A designated market area (DMA), which is typically associated with Nielsen data, may target based on zip code or state. Search Engine Land reported on a study by the Local Search Association that analyzed the CTRs of 10,000 ad campaigns and found variance based on the type of location targeting. All location-based advertising improved CTR; geofencing and geotargeting doubled the CTR, while DMA/zip code-level targeting offered a 50 percent lift. CTRs are not particularly illustrative by themselves. When a user clicks on your ad, do they take the desired action, such as buying a product or signing up for a newsletter? In the same Local Search Association study, researchers evaluated secondary actions like calling or requesting information. Again, all location-driven ads outperformed industry standards, but geotargeting was twice as effective as DMA-level targeting in generating secondary actions. Ultimately, secondary actions may be more meaningful for your campaign return on investment than CTRs. To give you an idea of what kind of numbers you might be looking for, Street Fight notes that a location-based marketing campaign from Whole Foods resulted in a post-click conversion rate of 4.69 percent, versus the national average of 1.43. Many clicks on mobile are accidental due to the relatively small screens. CTRs often default to the "last click model," which attributes credit to the click right before the sale. Multiple device use and switching to computers before making a final purchase can distort the true consumer path to purchase. Click-through rates, when taken in isolation at the publisher level or during one time period, may not be reflective of campaign performance as a whole. Are your conversions telling a different story? Should you be further localizing your ads? Are your targeting criteria displaying your ads to the right audiences? Would a different form of location-based advertising be more effective? That is, should you broaden or narrow your reach? Calculating ROI on your campaigns is important, but relying solely on click-through rate to determine it may not be giving you a full picture of your campaign's success. Location-based CTRs vary depending on the level of localization. 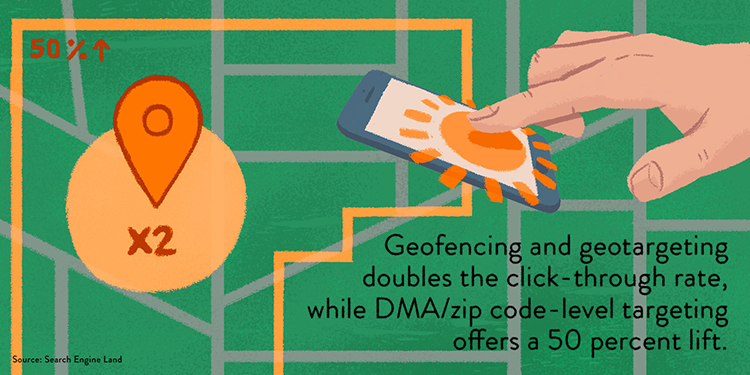 Geotargeting and geofencing improve CTR 2x, while zip code-level localization produces 50 percent lift. Advertising CTR is a meaningless statistic unless it's paired with data about follow-up conversions and secondary actions. CTRs can give a distorted picture of return on investment when considered in isolation, through the "last click attribution" lens, and without screening for accidental clicks.